“Someone set up our Social Media pages ages ago and we do plan on doing something with them, but are always so busy and it falls to the bottom of our to do list”…??? STOP NOW – is DIY really working? So you have a good website, that seems to be working well and looks great – but are you missing out on keeping your other digital shop windows tidy, we are talking about FACEBOOK and TWITTER. Both your website and Social Media groups can be found through a Google search, and a lack of regular posting or old information being displayed, makes your business look shabby and you appear disinterested in keeping your customers up to date. Are posts happening regularly, and if someone has asked a question, does it get answered quickly? If not, why not? OUTSOURCE IT to FRANK COMMS! 1) They DON’T have the Time for FB messaging or tweeting ( some companies tweet up to 5 times a day). 2) They DON’T have a posting strategy. 3) They DON’T know how to convert business from it. 4) They are frightened that other people will be able to see their followers – they don’t have to! 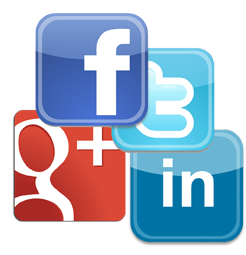 Your Facebook,Twitter, Google Plus and LinkedIn feeds should be kept up to date with daily posts, then people who like the look of your business, can start to get to know you from your postings – almost on a one to one basis. Your target audience IS using Social Media so why aren’t you? > Social proof – By having a social media presence that is engaging helps reassure clients that your business is reputable and can be trusted. Social media is an open book. If someone likes you then great, everyone can see it. If someone doesn’t like you and mentions something negative about your brand or experience then this too is available to the community, but by us managing it, we can delete it if necessary. > Humanise your brand – Copying and pasting marketing lingo about your business and products is a bit boring, to be honest. You have a quick amount of ‘reading space’ to do it in and so the environment you are selling in is completely different. We know how to get your message across. Social media gives your business the opportunity to reach out and actually connect with your audience, link to interesting articles that might be relevant to the target audience, competitions, local events. Make your Social Media feeds news, noticeboards that your customers are keep to follow. > Builds Your Sphere of influence – Your sphere of influence is the people in and around your brand that you interact with. When you manage to develop a relationship with members of your group, they will start to like items and even comment. Their interactions will be seen by their friends who might possibly decide to join in too, thus spreading the word. > Your competition is using it – Your industry or niche is represented on Social Media. It is! If you don’t believe us go to Google and do a search for: “Your niche” + “Facebook” and see what comes up. >Once Again – Your target audience is using it. What would it mean to your business if you had 8 new customers? Let us help you get them for less than a monthly advert in a newspaper.